This is quite an interesting first shot, especially since its almost exactly its production counterpart's opposite in terms of coloration. The TIE Pilot is actually one of the more--in my experience--frequently seen vintage first shots; but this is certainly the first time I've seen an all-white example. It might have been a white first shot such as this that was used in the creation of the vac-metallized protoypes of this figure that are known to exist. 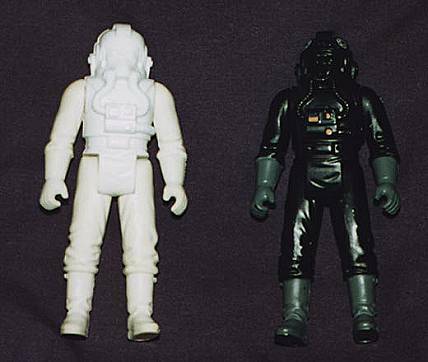 The figure pictured at right is a standard production figure.